The dice were just meant to be promo items, to give to game store managers and the like. But they’re too cool to only use them for promos. They’re from Chessex. It’s hard to tell in the picture, but the blue one is a sort of shimmering blue, and the white one is pearlescent. The graphics are engraved and inked, not just printed, so they’re permanent. In short, these dice are way cool. So what could I do with dice when the whole point of TableMaster is to do without dice? 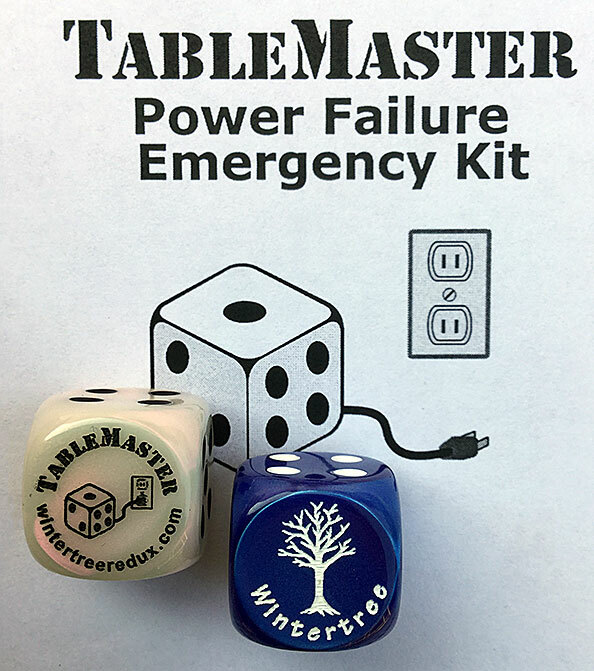 An emergency kit of dice and tables in case of power failures, obviously! This morning I put together a package design, as shown. I’ll put them in some little bags and have them available on the website, and at SCARAB, the next convention Wintertree will be at. Naturally, the tables will work with TableMaster, too; they’re printed versions of TableMaster tables, so they say .roll <2d6> instead of just roll 2d6, etc. I’ll have them up on the website store as soon as I have all the packaging and finish the design. They make great stocking stuffers!